While rolling out the dough for this tart my husband called from work for our ritual lunchtime chat. I could tell right away that he was not in the brightest mood. As I rubbed flour across the rolling pin and began to flatten the round of dough on the table he vented his frustrations about employees, morning traffic and extra meetings. I listened quietly, as I always do when he is in this mood, agreeing that morning traffic is terribly frustrating and extra meetings are indeed inconvenient. “…. 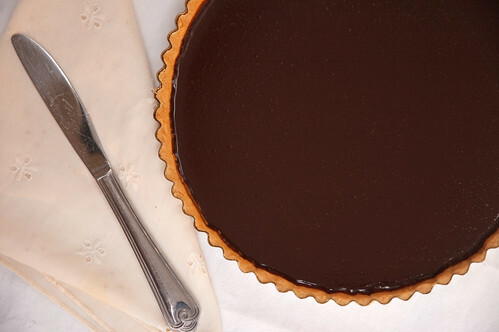 Really… a chocolate tart… that sounds really good right about now…” His voice sounds brighter, more cheerful. I know I am getting to him. I go in for the kill. “That sounds great! What’s for dinner?” I got him. He has forgotten about traffic, employees and meetings. His mind is now on more important things… like what kind of pasta pairs best with sausage and mushrooms. Recipe from The Art of Simple Food by Alice Waters. My favorite and most used cookbook. 1. Warm cream in a stainless steel bowl. I used a double boiler method for this step. To do this place a medium-sized bowl over a pot 1/3 full of very warm, but not boiling water. Put your stove on low to keep the water hot. 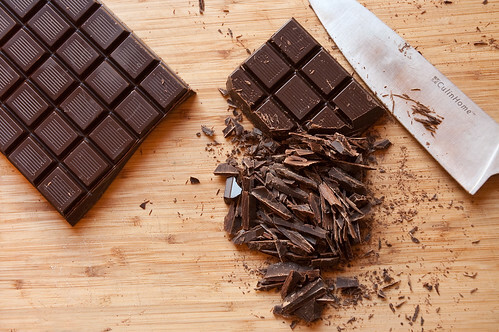 This is a gentle way to melt chocolate without burning it. Be sure to keep all water away from the chocolate or it can seize and will be ruined. 2. When the cream is almost too hot to touch, remove from the heat, add the chocolate and gently stir to melt and completely combine. Careful, if you stir too quickly your chocolate will form bubbles. 3. When the chocolate and cream are completely combined, but still very warm pour chocolate into the pre-baked tart crust. 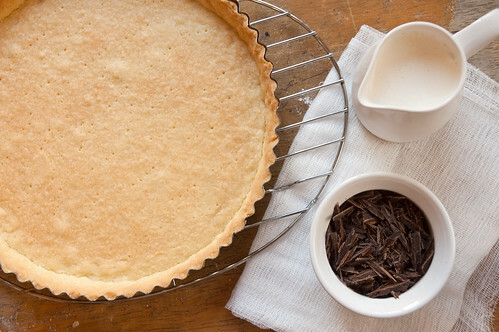 Gently tap the side of the tart pan to even out the filling. 4. Leave tart to cool for an hour then very carefully move it into the refrigerator until completely firm, about 2-3 hours. 5. You must eat this with whipped cream and a glass of milk, there is no other way. This tart is just screaming for flavor additives. Peppermint, almond, rum, brandy, orange and that’s just the beginning. 1. Beat butter until smooth. Add sugar and beat until fluffy and creamy. 2. Add salt, vanilla and the egg yolk. Beat until combined. 3. Add flour and mix with a wooden spoon until the dough is crumbly and most of the flour is mixed in. Mix the rest by hand until all flour is gone and the dough forms a ball. 4. The dough must be refrigerated before rolling so place the ball onto a long piece of plastic wrap. Flatten the ball with the palm of your hand into a disk shape. Wrap in the plastic wrap and place in the fridge for at least 4 hours or up to two days. You can also store this in the freezer for a couple of months, but you have to refrigerate it overnight to thaw before using. 5. When ready to use take dough out of the fridge 20 minutes before you are ready to roll so it can soften a little. 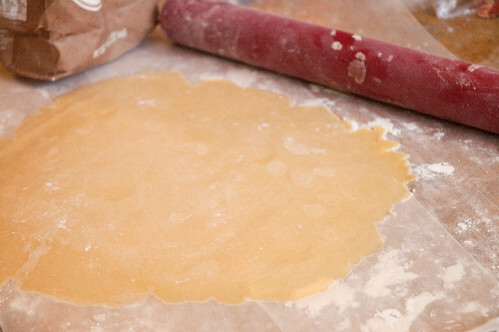 I found it easiest to roll the dough between two sheets of floured wax or parchment paper until it is 1/8 inch thick. 6. Remove the top piece of wax paper and slide your hand under the dough and on top to support it. Then carefully flip it over onto a tart pan. Its okay if it breaks a little, you can reroll it, or just patch the cracks with extra dough. 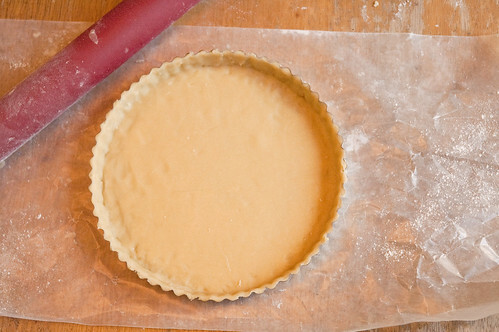 Very carefully remove the last piece of wax paper and tuck the dough into the tart pan edges. 7. Trim the edges with your fingers and save the extra dough for jam thumbprint cookies. Prick the dough all over with a fork and place the whole thing in the refrigerator for 15 minutes to rest. Meanwhile preheat your oven to 350F. 8. Bake shell in the oven for 15 minutes or until it’s a light golden brown. Halfway through baking check the tart and very gently pat down any bubbles that might be forming. When its finished baking cool the shell completely before filling and unmolding. Fill tart shell with any kind of sweet no bake fillings and enjoy! Thank you so much for this recipe! I am going to make it in the weekend…can’t wait! To see my site listed under “beautiful food blogs” is humbling, when *your* food blog is so clean, bright, and aesthetically lovely. I’m glad you found me, because it allowed me to find you. 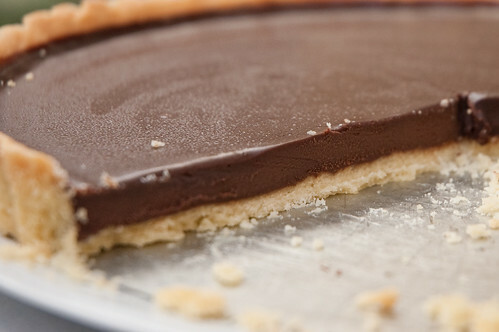 Also, this chocolate tart… how grabby would I be if I asked for two slices? I have to read that cookbook! I have it on my bookshelf because I asked for it for Christmas and I still *cringe cringe* haven’t cooked anything from it. Am off to make my husband happy too! well, looks like there is nothing in this world that cannot be fixed with a good tarte a chocolat. glad you hubbie was happy again. I’ll call you next time I have a bad, perhaps you’ll make one for me too LOL. How sweet! Jell-o makes my husbands day brighter 🙂 But I will try this recipe, might just make him extra happy! How can you go wrong with dark chocolate and shortbread?? This looks serious decadent! the world would be a much much better place if everyone had this to come home too! This pie looks wonderful, hope your husband felt a lot better after having some. I see you are pretty new to the blogging world, not much newer than me. So welcome! This is one of the best looking chocolate tarts I’ve ever seen! I’m drooling! Dont know about my hubs but it sure would make me happy! This is beautifully written…. :-)…..and I would like to eat all those things, too, by the way! Yum. Photos are spectacular — (I am such a pushover for step-by-step) and even the plates are gorgeous. My compliments — on everything!! 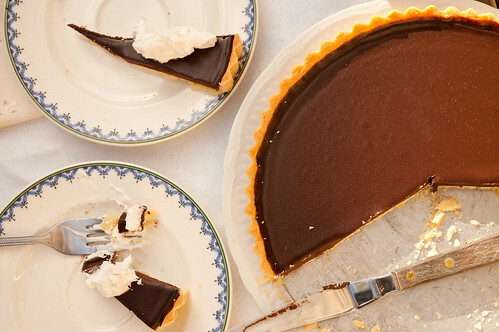 turned out exactly how i imagined – this is the best choc tart recipe ever! It looks wonderful. Next to flourless chocolate cakes, no bake chocolate desserts are the best! The chocolate is able to come through and shine in all its glory, uninhibited by other ingredients. I’m bookmarking this recipe to make someday, or just the filling alone as it would make an excellent mousse, I think. I love how simple it is. Love this post 🙂 Isn’t it great how food can just fix bad moods and bring people closer together? Lovely photos! Thanks for the wonderful recipe! No bake pies = instant crowd pleaser, I think, ehehe. 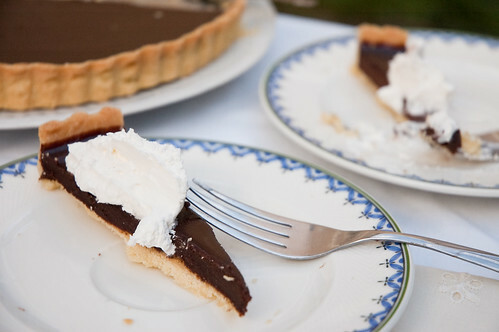 I just made this chocolate tart and it was delicious! The filling is so smooth and velvety. Yum, a small slice is just enough since it is very rich, I had a comment that the filling resembled nutella. This was loved by all, thanks.